Wednesday, March 30 marks the 10th anniversary of To Write Love on Her Arms. While I haven’t been completely invested in TWLOHA since its start, I have known about the organization for most of its 10 years of existence. 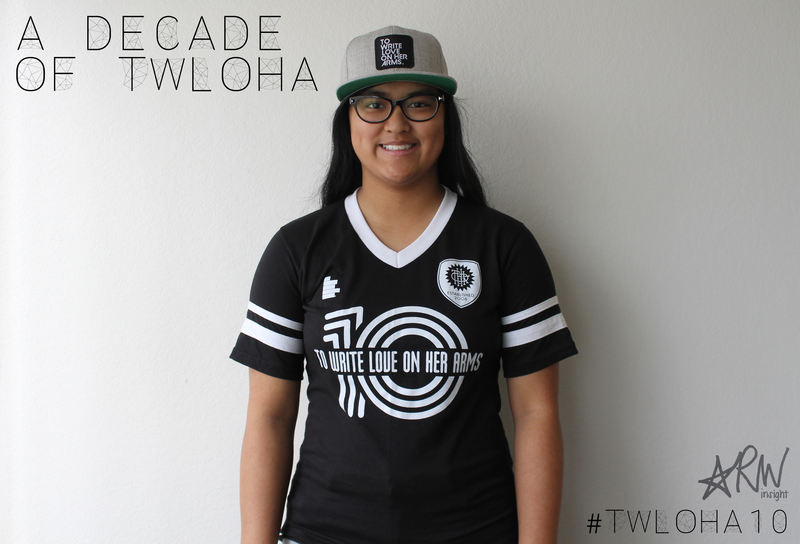 In recent years, I’ve become very, very supportive of TWLOHA and its message, contributing to the excitement I felt when I first heard about #TWLOHA10. My wallet, however, wasn’t as excited to learn about the #TWLOHA10 collection. I restrained myself from buying more than one item from the collection, though, and settled for the “City Shirt” because I don’t have a shirt like it already. When I received my shirt in the mail, I found four #TWLOHA10 response cards accompanying my shirt. (Print out the cards, and fill them out!) 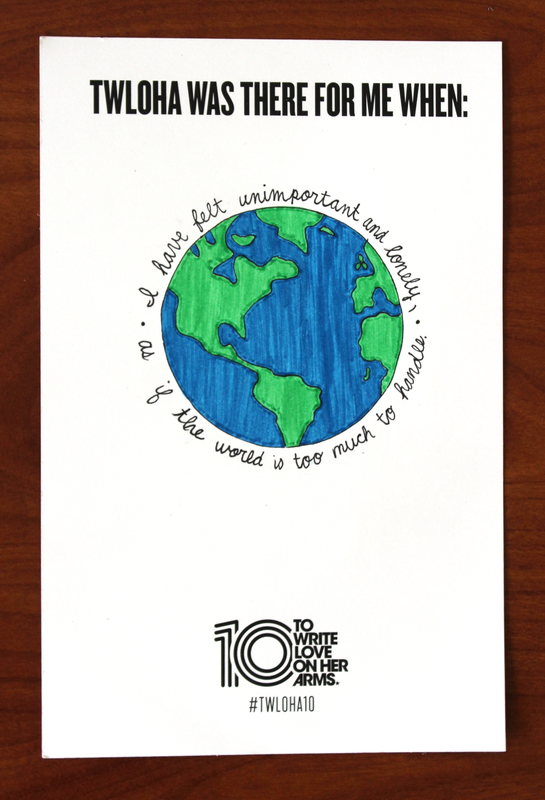 The cards were meant to be filled out to helped celebrate TWLOHA’s 10th birthday. As I thought about what to include on the card, I realized I wanted to write several sentences, an entire paragraph, maybe even a few. I didn’t want to do that, and I didn’t want to post four different photos of each card on Instagram with a short story. I didn’t want to just have black words on the card either. I also wanted to be creative, so that’s what I did. Or at least, that’s what I tried to do. I found out sometime in middle school. I can’t quite pinpoint the exact moment when I first heard about TWLOHA or discovered its message, but it’s safe to say Zumiez played a large part in my learning about the organization. I used to go to Zumiez a lot more in middle school, and I always remembered seeing the variety of TWLOHA shirts they were selling. I always thought they were really cool, liked TWLOHA’s message, and wanted to get the shirts. 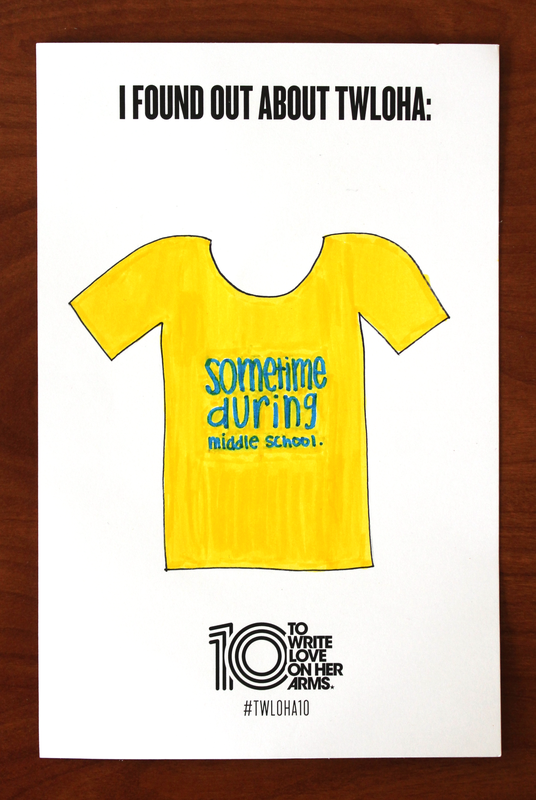 But I was just in middle school, and buying $20-plus shirts were always plausible. Regardless of that, I did buy my first TWLOHA shirt from Zumiez: It was a pastel yellow shirt with “to write love on her arms.” in bold, blue font on the front. It was on sale, so I could afford it. I outgrew the shirt quickly and wasn’t too invested in the organization despite buying the shirt. But I figured buying and wearing the shirt would be a decent way of still showing my support. And I continued to follow TWLOHA through various social media outlets from there on. I didn’t become really interested in TWLOHA until I started college, though. What triggered my sudden increased interest in TWLOHA and supporting the organization is still a little unclear to me. Maybe it was the fact I was more mature than when I first heard about TWLOHA and could relate so much more to its message—in case you didn’t know, college is really difficult and so stressful in more ways than one. I’m glad my interest grew, though, because TWLOHA’s message is so important. Anxiety, depression, and other mental illnesses are so much more common than people realize, but it’s vital to know people are going through such things and need help and support to get through them. Because of TWLOHA, I now truly realize that no one else can play my (or your) part, so you’ll see me tomorrow. TWLOHA was there for me when I have felt unimportant and lonely, as if the world is too much to handle. Life has also felt like, at time, it will only get harder. Those are thoughts that overcome my mind more often than I would like. But I’m fortunate that those thoughts have never been a true threat to the rest of my life. And even if it may take me some time to realize it, I ultimately know there’s reason to be hopeful. I am important, and there will always be people who support me. The world can be overwhelming, but it does get easier—it will get easier. My favorite TWLOHA memory is when I met Jamie Tworkowski last summer in Naperville. He had the “Chicago” stop of his book tour at Hollywood Palms in Naperville in conjunction with Anderson’s Bookshop, and I knew I wanted to go to it before the details about the event were made known. Meeting him is my favorite memory for a couple of reasons, but I think it’s mostly because I got to meet a great writer who’s an even better person. I’m a writer, too—though not in the same way Jamie is. But I had recently read his book and was so touched and amazed by all of his words in his book, If You Feel Too Much, so it was great to hear from the man who wrote such honest and meaningful words. And the words he spoke at the event prior to the actual book signing had the same effect on me. Jamie has such a beautiful ways with words, and his words will always be some of my favorite. 10 years from now, I hope to be happy. I’ve learned that happiness is the most important thing to have in life. So, regardless of whether I have achieved my dreams or have yet to fulfill them, if I’m truly happy and enjoying the life I’ve been blessed with, it’ll be okay. My happiness is what will fuel me to keep reaching for my dreams and to keep pushing for myself to be a better person. 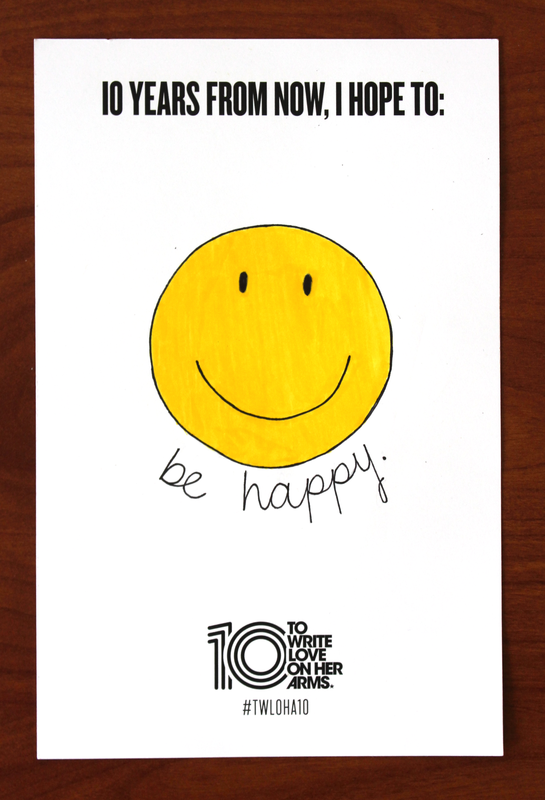 But, 10 years from now, I hope to also help others find happiness and to make sure others know they deserve happiness. I know that’ll help me achieve my own happiness, too.